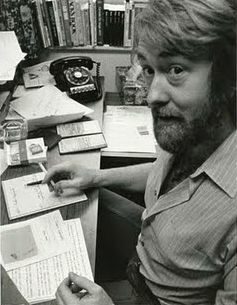 Jay Scott was film critic for The Globe and Mail from 1977 until his death in 1993. From 1981 to 1989, I was assistant producer and co-host of the radio show On the Arts at CJRT-FM in Toronto. With the late Tom Fulton, who was the show's prime host and producer, we did a half-hour interview program where we talked to artists from all fields. In 1994, after I had gone to CBC, I had an idea to collate an interview anthology from some of the more interesting discussions I'd had with guests from that period. Since they all took place during the Eighties, I thought I could edit the collection into an oral history of the decade from some of its most outspoken participants. The book was assembled from interview transcripts and organized thematically. I titled it Talking Out of Turn: Revisiting the '80s. With financial help from the Canada Council, I shaped the individual pieces into a number of pertinent themes relevant to the decade. By the time I began to contact publishers, though, the industry was starting to change. At one time, editorial controlled marketing. Now the reverse was taking place. Acquisition editors, who once responded to an interesting idea for a book, were soon following marketing divisions concerned with whether the person doing it was hot enough to sell it. Tom Fulton, host and producer of On the Arts. For a few years, I flogged the proposal to various publishers but many were worried that there were too many people from different backgrounds (e.g., Doris Kearns Goodwin sitting alongside Oliver Stone). Another publisher curiously chose to reject it because, to them, it appeared to be a book about me promoting my interviews (as if I was trying to be a low-rent Larry King) rather than seeing it as a commentary on the decade through the eyes of the guests. All told, the book soon faded away and I turned to other projects. However, when recently uncovering the original proposal and sample interviews, I felt that maybe some of them could find a new life on Critics at Large. Talking Out of Turn had one section devoted to reviewers who ran against the current of popular thinking in the Eighties. That chapter included discussions with New Yorker film critic Pauline Kael, who had returned to writing in the Eighties after a brief hiatus as a consultant in Hollywood, talked to me in 1983 about how the Reagan decade was already having a deadening impact on the movie industry; author Margaret Atwood, who turned to literary criticism in her 1986 book Second Words, discussed – from an author's perspective – the value of criticism and how it was changing for the worse during this decade; Vito Russo, who in 1981, wrote a book called The Celluloid Closet: Homosexuality in the Movies, which examined the way gays and lesbians had been portrayed in the history of American movies; and Globe and Mail film critic and author Jay Scott (Midnight Matinees) who spoke about how, despite being one of Canada's sharpest and wittiest writers on movies, he was initially a reluctant critic. 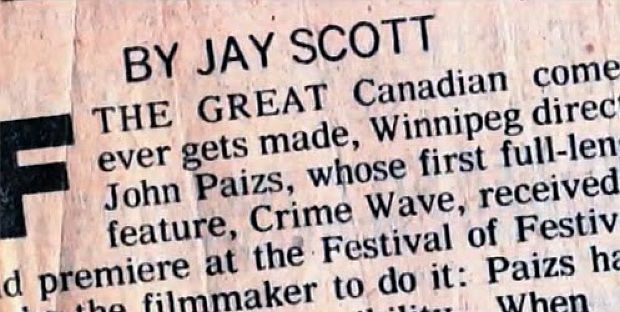 One of Canada's best film critics, Jay Scott died from AIDS on July 30, 1993 – 23 years ago today – but in his short life he left quite a mark on the Canadian cultural scene. When he sat down with me in his hotel room in 1985, we were both in Montreal covering the Film Festival and talking about his book of criticism, Midnight Matinees, which had just come out. He spoke about how his passionate love for movies would ultimately grow into a life of film criticism. No surprise that after our long chat, we both ran off to catch Paul Morrissey's Mixed Blood. I think he enjoyed it more than me. Here is the full interview with Jay Scott as it aired on CJRT-FM in 1985.
many thanx for resurrecting this nugget. in all these years it has aged little.